Injectable Medicine Therapies is a highly interactive, visual and self-paced learning environment designed by experienced nurse educators and clinical pharmacists. This Advanced Skills module builds upon the dosage calculation competence developed within the Essential Skills module. It is designed to develop and assess the competencies required for safe medication practice with the more complex problem solving and calculations associated with injectable medicine therapies such as intermittent and continuous infusions. This module will prepare health professionals for safe IV medication practice on general and specialist wards, high dependency and intensive care units. It provides a comprehensive assessment of cognitive competence that includes a range of safety checks, equation setup and calculation, and the accurate setting of rate of administration and volume of IV infusions. 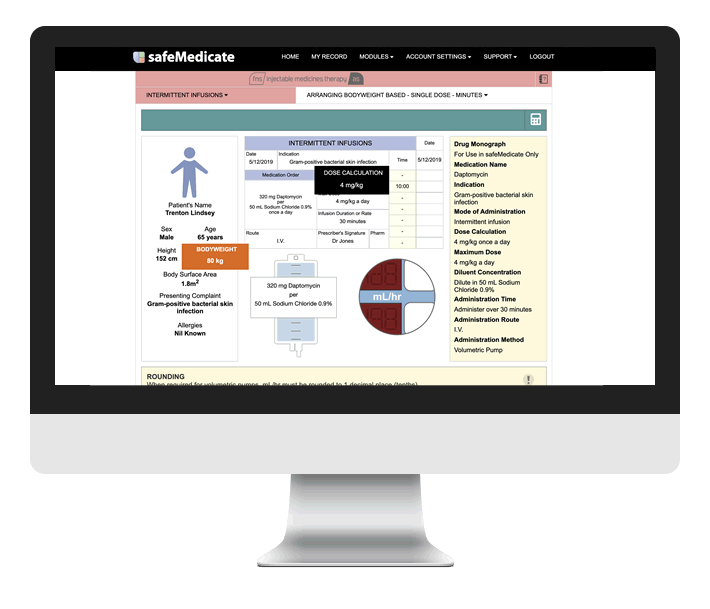 You'll use our unique authentic dimensional analysis system as the equation framework for solving injectable medicines calculations for intermittent and continuous infusions. This program is endorsed by ACN according to our Continuing Professional Development (CPD) Endorsed Course Standards. It has been allocated 7 CPD hours per module according to the Nursing and Midwifery Board of Australia – Continuing Professional Development Standard. Like to try? 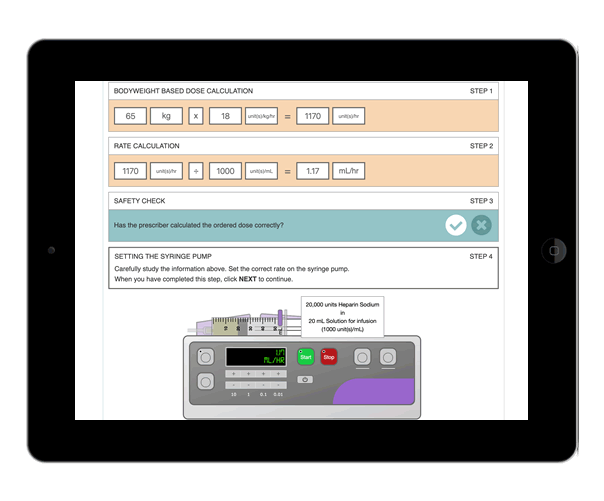 Check out our safeMedicate Interactive Demonstration (SiD) to try example problems from each of the key modules. Need more information? Download a copy of our latest brochure. It's packed full of everything you need to know to help you make a decision. Prefer a demonstration? Join us for one of our free webinars and let our product specialists walk you through the key features and functionality. Ready to buy? Visit our secure online store and be up and running in minutes with a shiny new personal safeMedicate account.